We provide all SEW Eurodrive Helical Gear Motors, MOVITRAC, Helical Bevel Gear Motors, Helical Worm Gear Motors, Parallel Shaft Helical Gearmotors, VARIGEAR and VARIMOT Variable Speed Gearmotors, TorqLoc as well as Screw Conveyor Drives. 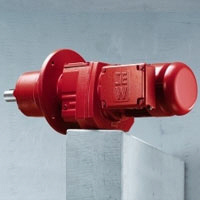 In six single-stage and fourteen two-stage and three-stage sizes, the helical gearmotors by SEW-EURODRIVE ensure an optimum ratio between power and space requirements. The tried and tested modular concept and strict quality criteria allow SEW-EURODRIVE to provide a diverse range of torques and reduction ratios with incomparably finely tuned gradings. With this exceptional diversity, SEW-EURODRIVE sets new standards in the field of drive engineering. RM gearmotors with extended output bearing hub are a special type of helical gearmotor. They were designed especially for agitating applications and allow for high overhung and axial loads and bending moments. The remaining data corresponds to that of standard helical gearmotors. Purchase your SEW Eurodrive Helical Gear Motor RM Series today!